For most people, RVing is all about summertime fun. For others, RVing may also fit into the schedule for the shoulder seasons of spring and fall. Winter doesn’t get all that much love for many RVers, but there are a select number of few who like the small crowds at parks and different landscape that winter brings. But winter, along with parts of fall and spring may bring a hazard to the table, icy roads. Regardless if you only RV in the summer, navigating icy roads in the winter is something every RVer should be skilled at, especially if you RV at the end of fall going into winter. 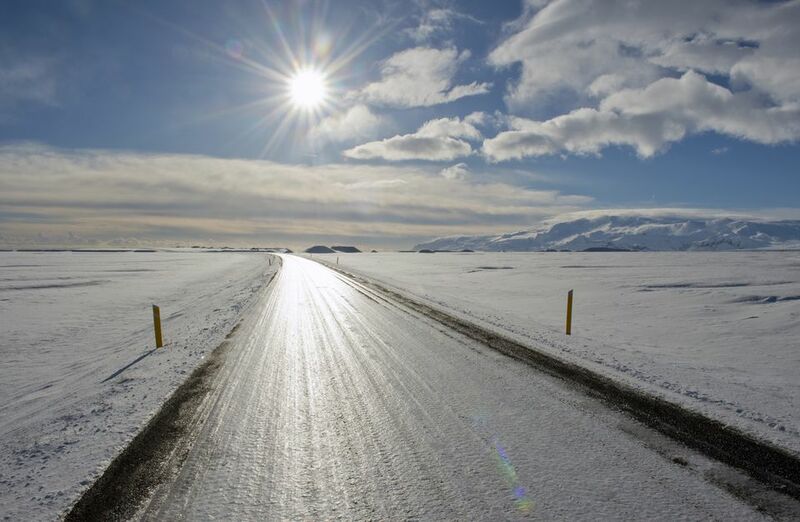 Here are our tips on how to navigate icy road conditions when RVing. Speed is not your friend when driving on icy roads. The more speed you have, the less control you have. This is especially prevalent when driving on icy roads. The idea behind driving on icy roads should always be a smooth steady pace. Accelerating and decelerating is more apt to cause your tires to lose traction leading to spinouts, slides, and accidents. So remember, when it comes to driving in icy conditions, it’s always best to keep an even, steady pace. If you haven’t yet purchased a weight distribution/sway control hitch and you plan on hitting icy areas, you may be for a wild ride. We already recommend that any trailer owner look into purchasing a weight distribution/sway control hitch for their towable and even more so if you plan on taking that trailer or towable into icy conditions. Tow vehicles and trailers that are off balance are much more likely to spin and slide along icy roads and you’ll have a difficult time reigning in a trailer that has started to sway on an icy road. Both of these can be solved with the installation of a high-quality weight distribution and/or sway control hitch. The weight distribution hitch will allow all four tires to have a more solid grip on the road while a sway control hitch can help to keep your trailer from drifting in the first place. If you find yourself in snowy or icy conditions it may be a good idea to upgrade your tires altogether or invest in a set of snow chains. You can stick RV snow chains on most RV tires, giving you an entirely new level of gripping power and traction. If you don’t like the hassle of putting on and taking off snow chains that you should consider investing in a complete set of RV snow tires. Tires, chains, or a combination of both can help give your RV that secondary level of grip to keep you from slipping and sliding around on icy roads. If roads are icy or snowy than there’s one sure-fire way to keep you and others safe on the road, don’t get on it. One of the joys of being an RV is not having to follow set check-in times or bookings so don’t try to push yourself or your RV in dangerous conditions. If you’re white knuckling your steering wheel you are already in too much stress. Find the nearest truck stop or even wide shoulder if need be, pull over, brew up some coffee or hot cocoa and wait for the worst of the storm to pass. Always better safe than sorry, especially with something as cumbersome as an RV. These are some of the main points on how to navigate icy road conditions when RVing and should be followed to help keep your journey safer. Remember, if things are hairy don’t push yourself and find a safe place to wait the worst out.